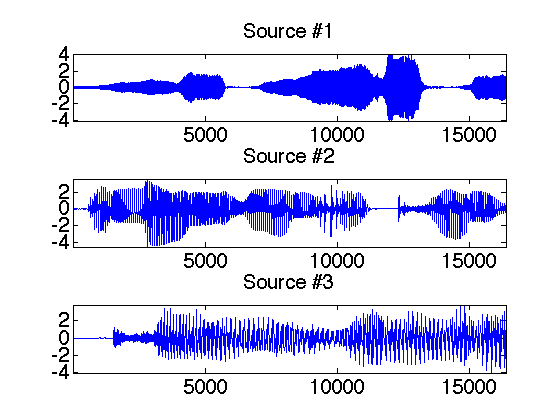 This numerical tour explore local Fourier analysis of sounds, and its application to source separation from stereo measurements. 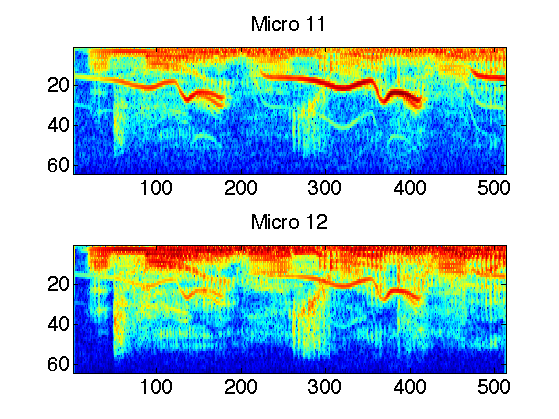 We load 3 sounds and simulate a stero recording by performing a linear blending of the sounds. For Scilab users, it is safer to extend the stack size. 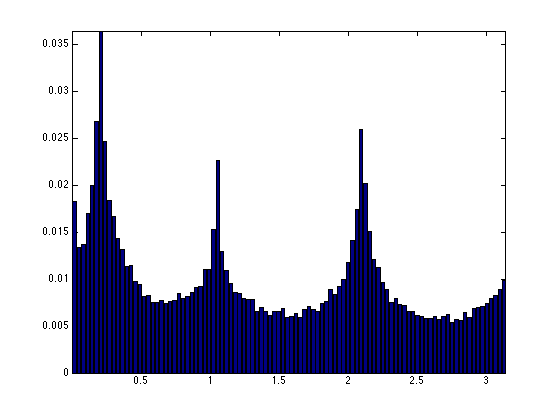 For Matlab users this does nothing. 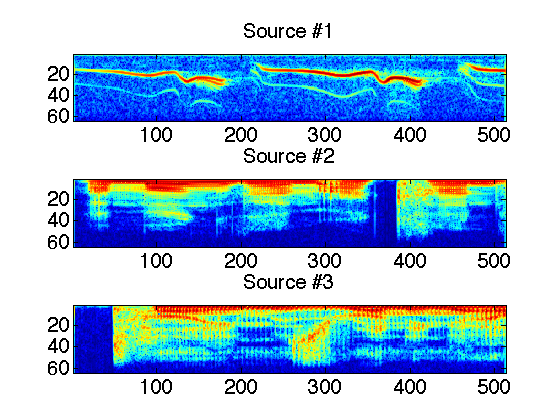 Display of the sounds and their mix. Display of the micro output. 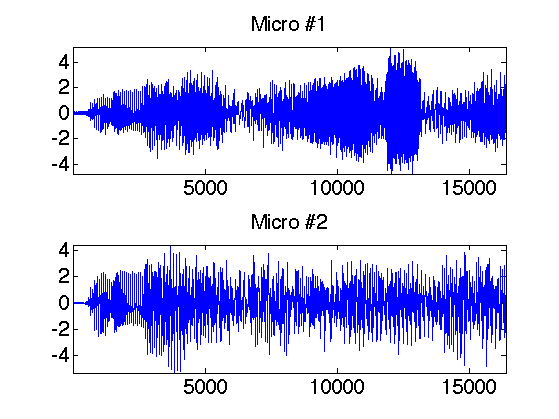 In order to perform the separation, one performs a local Fourier analysis of the sound. 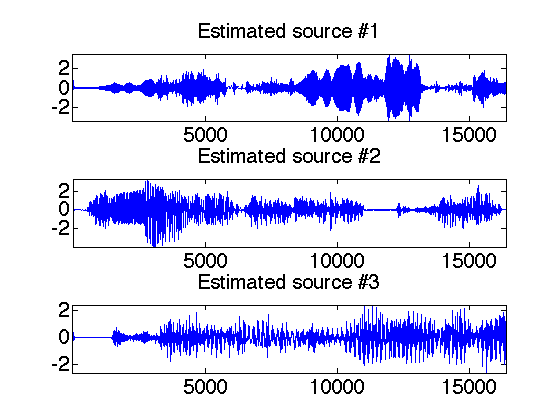 The hope is that the sources will be well-separated over the Fourier domain because the sources are sparse after a STFT. First set up parameters for the STFT. Compute the STFT of the sources. Exercice 1: (check the solution) Compute the STFT of the micros, and store them into a matrix Y. 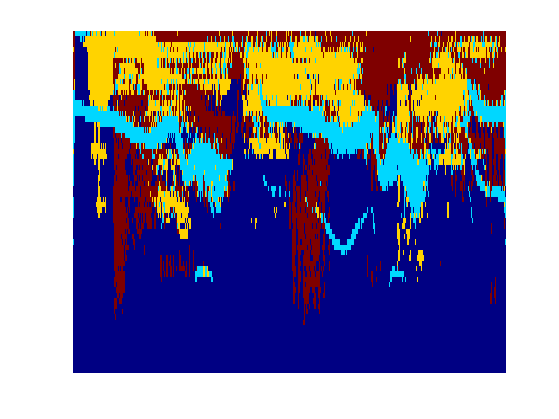 Since the sources are quite sparse over the Fourier plane, the directions are well estimated by looking as the direction emerging from a point clouds of the transformed coefficients. First we compute the position of the point cloud. Then we keep only the 5% of points with largest energy. 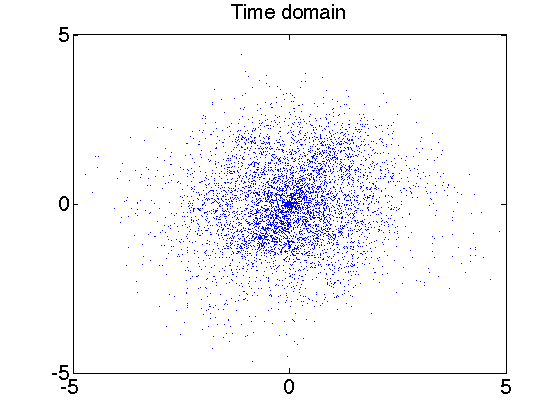 Display some points in the original (spacial) domain. Exercice 2: (check the solution) Display some points of P in the transformed (time/frequency) domain. 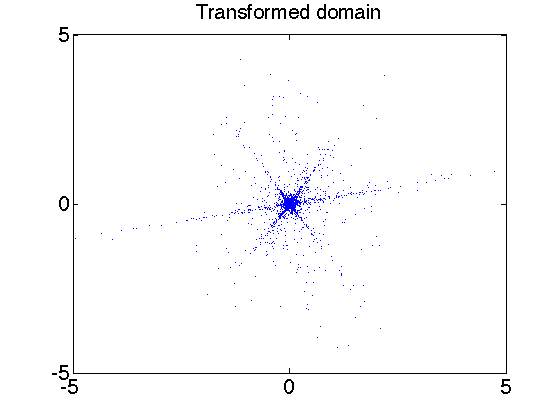 We compute the angle associated to each point over the transformed domain. The histograms shows the main direction of mixing. Exercice 3: (check the solution) The histogram computed from the whole set of points are not peacked enough. 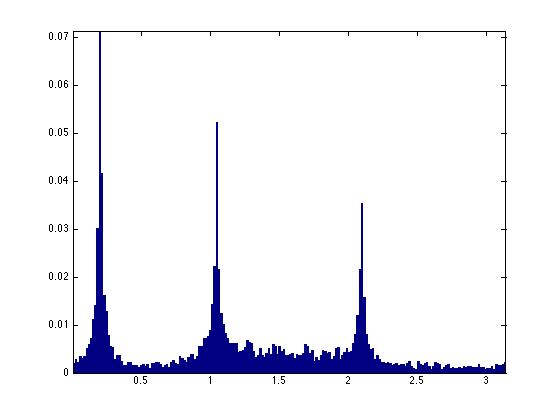 To stabilize the detection of mixing direction, compute an histogram from a reduced set of point that have the largest amplitude. Exercice 4: (check the solution) Detect the direction M1 approximating the true direction M by looking at the local maxima of the histogram. First detect the set of local maxima, and then keep only the three largest. Once the mixing direction are known, one can project the sources on the direction. We compute the projection of the coefficients Y on each estimated direction. At each point x, the index I(x) is the direction which creates the largest projection. An additional denoising is achieved by removing small coefficients. We can display the segmentation of the time frequency plane. The recovered coefficients are obtained by projection. The estimated signals are obtained by inverting the STFT. One can display the recovered signals. One can listen to the recovered sources.